A first silage cut of 8 t DM/ha would remove nearly 200 kg K2O/ha and a second cut of 5 t DM/ha a further 100 kg K2O/ha. Uptake of potash will be greater than removal as some will be retained in stubble and roots and uptake is never 100% efficient. So the total potash supply needed to support removal in silage grass must be even greater. Some of the total supply needed will be met from exchangeable K in the soil but this amount will vary widely depending on soil type and K index. The rest must come from applications of manures and manufactured fertilisers. * The tables in the Nutrient Management Guide are accompanied by footnotes that are not shown here. There are two reasons for the large difference in recommendations between grazed and cut grass: Firstly, the yield of grass, and so potash requirement, tend to be smaller under grazing than under cutting due to shorter intervals between defoliations. Secondly, potash is recycled fairly efficiently by grazing animals. Nearly all the potash in plants, animals and manures is in solution as potassium ions. So the potassium in dung and urine of grazing animals is readily available for uptake by grass. Adult cattle produce around nine urine patches of about 0.5 m2 and twelve dung patches of about 0.05 m2 daily so after a year of grazing, a significant proportion of the pasture surface has received recycled potassium. By contrast, under cutting most of the potash taken up by the grass is removed and, for areas cut throughout the season, this can amount to 300-500 kg K2O/ha. The potash requirement of grassland therefore is quite well understood: large amounts can be taken up and removed, these amounts need replenishing and long-established nutrient recommendations take this into account. But are these recommendations always followed? Fertilisers are not the only source of potash and a considerable amount reaches grassland soils in applied slurry and FYM. The British Survey of Fertiliser Practice shows that in 2017 34% of grass area in Great Britain received organic manures (34% in England/Wales and 30% in Scotland). 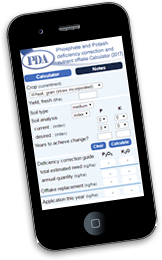 It can be calculated that the overall rate of potash application in manures in Great Britain was around 50 kg K2O/ha. So even allowing for use of manures, it looks as if grassland overall is not receiving sufficient potash. This overall insufficiency means that some fields will be adequately supplied but many, probably most, will not. National soil analysis results reflect a lack of adequate potash nutrition of grassland. The annual reports produced by PAAG (Professional Agricultural Analysis Group) show nearly half of grassland soil samples to be below the target K index of 2- and some yield effects can be expected. Information from several sources indicates that potash use on grassland needs attention. Insufficient potash will lead to reduced silage and grazed grass yields, hitting margins. Clover is especially sensitive to potash deficiency so mixed grass/clover swards are at particular risk. Soil sample fields regularly (every 3-5 years) for routine analysis (pH, P, K, Mg). The analytical cost is very small, around 25p/ha/year. Measure or estimate the potash content of manures applied. For estimates, use the tables in the Nutrient Management Guide (RB209), not those in the previous 8th edition RB209 as they have been updated. Check potash use is in line with recommendations in the Nutrient Management Guide (RB209), taking manure contribution into account.